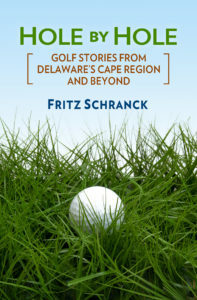 Family events and the Rehoboth Beach Independent Film Festival recently kept me off the golf course for a while. On my return, I learned again how the golfer’s mind affects his or her approach to the game. Last Sunday was the first time I’d played golf at Shawnee Country Club since late October. The club’s computer is shut down, and my handicap index will remain at 16.9 until April 1, for better or worse. The gray skies, low temperatures, and mild but damp breezes were a big change from just a few weeks ago. Even so, the near-total lack of leaves on the trees made the biggest impression. Recent storms brought a quick end to the modest parade of fall colors we normally experience in the Cape Region. The course looked starkly naked, with bare trees only partially obscuring the spaces between the fairways. I hooked my first tee shot into the trees separating the first and 18th holes. The ball clattered around and landed in a fairly open patch of rough, just inside the tree line. A tree and its overhanging branches blocked a direct shot from just over 200 yards out. I didn’t waste much time worrying about chipping out toward the fairway. Instead, I took out my hybrid club, took a practice swing, and thought about hitting a smooth draw. It worked just as I planned. Thanks to the denuded branches, I could watch the ball take off to the right, curve left, and bounce to a stop a few yards from the front of the green. On the par-5 second hole, I pitched out from the trees to set up an unobstructed fourth shot to the green from 95 yards out. This time, I took a practice swing with a gap wedge and thought about landing on the green about pin-high, with the ball spinning left toward the hole. Once again, it worked out just like I thought. The ball jerked left after the first bounce, and stopped 10 feet from the hole. The putt for par rolled in from right to left, into the middle of the cup. This experience continued for the rest of the round. The tee shot for the sixth hole landed in the rough about 140 yards out, on a sidehill lie. With the wind in my face, I thought about hitting my 6-iron so that it would draw in toward the hole on the left side of the green, over the front right-side bunker. After a practice swing, I took the shot, and again it did just what I wanted. The ball curled left, landed about 15 feet right of the hole, and rolled onto the fringe about 12 feet directly above it. The putt for birdie curled out of the cup and stopped a foot or so away, for an easy par. A fat-boy drive on the par-3 ninth hole left my approach shot a few yards short of the green. This time, I thought about pitching the ball to a spot about halfway to the hole, while taking a few practice swings. The ball landed exactly as planned, and rolled up to a few feet from the flag. The par putt was simple. Afterward, I thought about why the game seemed so easy on this overcast, chilly day, when it often seems so much more difficult during the summer. The answer didn’t take long to figure out. Now that it’s the off-season, when the scores don’t count, I stopped thinking about the number of strokes. Instead, I concentrated on the kind of swing I needed to make, and then just did it. You might think that after years of playing golf, I would remember this kind of experience in the middle of June, and bring my handicap down accordingly. Unfortunately, you might be mistaken. Now that I’ve written this column, however, I think my ability to remember this approach to playing might have a bit more staying power.